Pasta. Pasta is my one true love. I've recently been sick and all I've wanted to eat, day after day, is a big comforting bowl of pasta. It's warm and delicious, perfectly al dente and capturing the slick hearty sauce of whatever you've paired with it. This version is no different. Or maybe a little different, with the intensity and richness of flavor. Have you ever had raviolo di uova? Get ready because I'm about to drop a bombshell on you. This version is homemade pasta, rolled as thinly as possible, filled with tarragon goat cheese and filled with a perfectly poached egg inside. It's like a treasure chest, cutting through the ravioli to reveal the gold within. Since this is such an involved process, I thought an infographic might be helpful! Take a look and see if you prefer this layout of the recipe. slowly work the dough together with your hands. Knead the dough for 10-15 minutes. Wrap in plastic and allow to rest for one hour. In the meantime, mix 1/2 cup goat cheese with 2 tbsp tarragon. Roll out the pasta with the pasta roller using the flat roller. Start on the largest setting and progressively work down to the smallest. Cut the dough if it gets too long to work with. Dust your work surface and lay out the pasta dough. Carefully spoon a roughly tablespoon sized dollop of the goat cheese mixture on the dough sheets. end of a glass to cut around the raviolis. Bring a pot of salted water to boil. Carefully lower the ravioli into the water and cook for 2 minutes - until pasta is fully cooked but yolks are runny. First week at Momofuku is a roaring success. And despite the shaky legs I stood on today, manning the breads station by myself for the first time, everything still got done. The rhythm of the kitchen makes sense to me, to my hands, my dough-encrusted fingers. I arrive at 8:30 am and pull out the bagel doughs for the day to allow them to defrost. I whip together another batch of dough, scrawling the time on the plastic wrap with my trusted Sharpie, allowing it to proof for thirty minutes. I mise out my savory fillings, crack sixty eggs, bake two large potato gratins, paint egg washes. I love the smell of the bakery kitchen, the quiet hum of the ovens lining the back wall, the steady ache in my thighs that reminds me that I am doing, I am moving, I am creating. When I come home, I crave comfort food. That's why we're making macaroni salad today, that time-honored side frequently seen at barbecues and in grocery store delis. It pairs well with the 75 degree weather outside, cold and refreshing, aching for a light pilsner or lemonade and a plate of ribs to go alongside (or, if you're me, you first encountered macaroni salad as a part of a Hawaiian plate lunch and you will pair it with chicken and rice). I like this particular preparation of macaroni salad because of the gentle vinegary-ness and the quiet heat of the jalapeños. I, despite being a baker, like my sugar in my desserts and not my sides, so this recipe leaves out the oft-called for sugar or condensed milk. If you're looking for a grown-up macaroni salad, with heat and acid, crunchy celery and carrots, the bite of raw onion - then this is where I'll leave you. Bring a medium pot of salted water to a boil. Add macaroni and cook until just tender. Drain, reserving 1 cup of pasta water. Add pasta to a large bowl. Add onion, carrot, celery, olives, peppers, and jalapeno. In a small bowl, combine mayonnaise, Worcestershire, vinegar, horseradish, dijon, and sweet relish. Mix until thoroughly combined, adding pasta water until it forms a thick, pourable sauce. Toss with pasta mixture. Refrigerate for 1 hour or until ready to use. a wise man once told me "you cook squid for either forty seconds or forty minutes - nothing else". while the forty seconds is a bit of an exaggeration (I find two minutes is about perfect and if Mario Batali agrees with me, then i'm sticking with it). the third time was perfect. bright, garlicky but without the sting, lemony and with the right balance of oil to acid. soft, long bites of al dente fettuccine with that hint of salty, briny squid ink. the colors are dramatic - that might be my favorite part. this is something you serve when you want to be noticed. my mom's coming into town today, so this recipe is perfect. i need something quick. something that takes less than twenty minutes to throw together and has minimal cleanup. she'll be here this afternoon and i'm so ready. i've got restaurants picked out to take her to, tourist traps circled on the map. we'll go to prune. walk across the brooklyn bridge. see chinatown. see the met. go to the prospect park farmers' market. get a cocktail. get two cocktails. buy bread at bien cuit. play board games. bring a large pot of salted water to boil. add fettuccine. cook approximately 7 minutes or until just still toothsome. drain, do not rinse. in a small bowl, combine olive oil, red pepper, lemon zest, and lemon juice. mix to combine. in a saute pan, heat canola oil to hot. add calamari and cook for a minute and a half, until rings begin to curl. remove from heat and add garlic. cook quickly, about 30 seconds, until fragrant. toss with calamari. toss fettuccine with oil mixture. top with calamari rings. serve. spring's gentle weather makes me think of hawaii. warm breezes, the smell of green things, keeping the windows open. i've been keeping the window open in my tiny shower, letting the steam rush through. ramen comes in all different shapes and sizes, a cacophony of broths and noodles and toppings. since my own first love started on a bowl of saimin on hawaii's north shore, i guess there's little surprise that my preferences in ramen run very close to that original bowl. i like a heavier broth - something that stands up well to bold flavors like roasted pork and egg - and thicker, wavier noodles. no one knows exactly how ramen started. some say it began in china and carried over to japan - others claim it began in japan itself. now it's spread over, across cities and bridges, countries and continents. i spy it on signs and billboards on my way around the city, like hell's kitchen's totto ramen and ivan ramen on the lower east side - each with bowls brimming with broth and noodles and perfectly bias-cut scallions. preheat oven to 450 and place pork on a foil-lined half-sheet/sheet pan. roast until meat registers approximately 140-145 in the thickest part. remove, rest, and slice into 1/4 inch pieces. heat a small saute pan over high heat. add oil and heat. reduce to medium. add bok choy and saute until just wilted. remove from heat. set aside. bring a pot of salted water to boil. add 1 tsp baking soda. once at a gentle boil, add egg and cook for six minutes. remove with a slotted spoon or spider strainer and cool in ice bath. peel. slice in half. in a large pot, combine stock with miso and bonito, bring to a gentle boil. add noodles and cook until just tender. remove from heat. 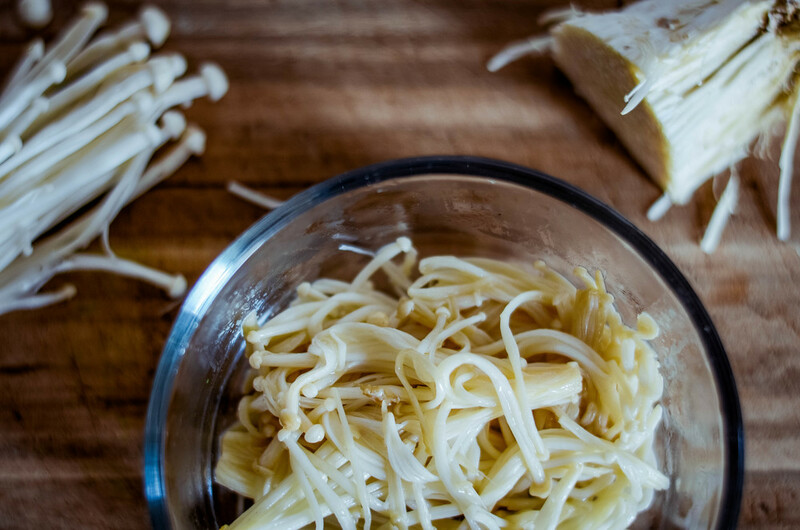 in individual bowls, place the bok choy and sauteed enoki in the bottoms. add noodles, then ladle broth to just about the tops of the noodle pile. garnish with pork, remaining enoki, soft-boiled egg, togarashi, and furikake. spoontang is growing! want to know when a new recipe is up? follow on facebook! pasta has always been my comfort food. i used to make pots of macaroni and cheese when i was younger. i loved the way the creamy, yellow sauce coated the pasta. i was never satisfied, i could have eaten until i burst. there has never been a pasta i've met and have not loved at first bite. i thrill to manicotti, to orzo, to baked ziti with marinara and mozzarella. anna and i watch masterchef regularly. once i saw this during a dreaded pressure test, i knew immediately that i needed to attempt it. i waited a few weeks, until the right evening. i love the serenity in making dough, in kneading the creation with my hands. i love this physicality, the repetitive motion. the brown butter sauce releases an intense nuttiness, a brilliant delicious flavor that, combined with the egg yolk within the pasta, is both deeply rich and light - perfect for fall. the ravioli's pasta will create a tight seal around the egg, allowing it to poach easily. you're aiming for a runny, perfectly poached center and cooked pasta. with fresh pasta, this should be accomplished in 2-3 minutes at a gentle boil. place the 2 cups flour and salt in a dome on a flat surface. create a deep depression in the center and crack in the eggs and oil. using a fork begin to beat the eggs and oil together with the flour from the inner rim of the flour well. take care to continue to push the flour back up to maintain the well shape. continue to beat until all ingredients are combined. knead dough for another 3-5 minutes until dough is firm and completely mixed. roll dough out in a pasta maker or on a floured surface until 1/16th an inch. cut into circles and place egg yolk in center of circle. salt egg yolk. bring a medium pot of water to boil. reduce to a rapid simmer and add prepared raviolis. cook for 2-3 minutes, until pasta is cooked through and shiny. remove from water. set aside. in a medium saucepan, heat butter over high heat for 2-4 minutes, until butter begins to brown. add salt and tarragon. stir. remove from heat. plate ravioli and cover with brown butter. add chopped tarragon for garnish. when i was a child, my father was in the u.s. military. by the time i was eight years old, i had lived in two countries and four different states. i was no stranger to packing up everything i owned into a few boxes and shipping it halfway across the world. my mother always took photos of every major item we owned, just in case something happens. nothing ever did. my things arrived safely in each new world. my first real memories begin when i am around four years old. before that, i catch glimpses. the birth of my brother. obstinately eating a lemon because i had declared that they were delicious and not sour at all - before ever having taken a bite. i remember eating the entire thing to prove my stubborn point, wincing with each bitter, sour taste. but in hawaii, my life flares out in bright memories. it is nothing but color, the green aloe vera plant in front of our house in waipahu. the bright blue skies and the pink hibiscus that littered the black asphalt on my walk to kanoelani elementary school. after we moved, one year later, to my father's hometown of des moines, iowa, the things i miss most are food. my tastes are irrevocably stamped by the breakfasts we had of fresh papaya. of getting matsumoto's shaved ice on the way back from the north shore on saturdays. of getting manapua, with that sweet steamed white bun stuffed to the brim with red barbecued pork. i learned to love seafood. i loved musubi from the corner store. but what i absolutely loved most, beyond all others and irredeemably, was a giant bowl of steaming fresh saimin. saimin, of all of hawaii's incredible food culture, is the most representative of the islands' past and shares a great deal with japanese ramen. it is made up of fresh egg wheat noodles with alkalinity added, to help keep its' firmness in the soup. the noodles are added to a dashi broth, and then topped most commonly with kamaboko (fishcake), char siu (chinese barbecued pork), scallions, and a gently-boiled egg. we ate saimin on saturdays, coming back from swimming on the north shore of oahu. we climbed through heavy leaves and over jagged, sharp rocks to reach a quiet, unknown stretch. the water was only three feet deep for a half-mile past the shore. i wore swim shoes to protect from sea urchins and electric eels. my parents kept jugs of clean water in the car, to wash our salty, sandy bodies with before we all piled in the car for the long drive home. along the drive back, we stopped for dinner. i remember the tiny restaurant, whitewashed and with all the doors and windows thrown wide. i remember wishing the bowl would never end. i wanted the noodles to last a lifetime. place all ingredients in a tightly sealed ziplock bag. squish as much air as possible from the bag and then place in the refrigerator, on a baking pan or baking sheet, for 12-24 hours. turn the bag once or twice during the marinating process. the next day, preheat the oven to 375 degrees. place the tenderloins on a rack above a roasting pan lined with tinfoil. roast for approximately 20 minutes. the internal temperature of the meat should reach 160 degrees. brush the outside of the pork with the reserved marinade and honey and place in broiler turned up to high. broil approximately 1-2 minutes on each side, depending on the thickness of your pork. cook the noodles in a large pot until tender. drain noodles and divide among four soup bowls. pour dashi broth into each bowl until noodles are covered. add scallions, snow peas, and char siu to each bowl, taking care to keep each item relatively separate (or follow your heart and mix them! hawaiian-style simply tends to keep each item distinct.) top with one gently boiled egg and furikake. serve. fight with your brother over who gets the last noodle.